Kicking off your music career with two top 10 hits is a pretty good start to things, but even though it looked like soap star-turned-singer Toni Pearen was destined to be Australia's big new pop star, things didn't play out that way. 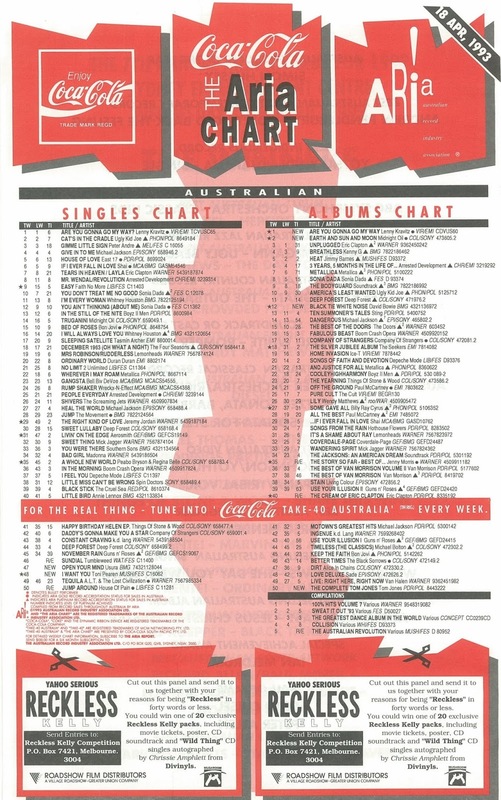 This week in 1993, the former E Street and future Home And Away star debuted on the ARIA singles chart with the second of those hits, but as we'll see, this was as good as it got for Toni - something that remains one of pop's biggest missed opportunities. Lenny Kravitz was making the most of his opportunity on top of the ARIA chart, registering a third straight week at number 1 with "Are You Gonna Go My Way". She'd had a big European hit in 1987-88 with "Joe Le Taxi", but it's surprising Vanessa Paradis's English-language debut didn't make a bigger impact locally given it was co-written and produced by her then-partner (and current number 1 single holder) Lenny Kravitz. This fourth single from Waking Up The Neighbours Adrenalize became the first to miss the top 50 - just! - for Def Leppard. They'd be back with new music and in the top 50 in a matter of months. Given the success of "Something Good", it made sense to give Utah Saints' Eurythmics- and Gwen Guthrie-sampling debut effort another shot. At least it made the top 100 this time. As well as being a missed opportunity, one of the greatest pop mysteries of the early '90s was just what went wrong with Toni Pearen's music career. Things had got off to a good start with her debut single, "In Your Room", reaching number 10. Follow-up "I Want You", which was a breezier, more laidback track, repeated the feat and then... nothing for a year-and-a-half, by which time any momentum had been lost. Quite why a third single and/or an album didn't come hot on the heels of a second top 10 hit is unclear, but whatever the reason for the delay, it was undoubtedly a major factor in Toni never reaching anywhere near as high on the chart again. Number 47 "Open Your Mind" by U.S.U.R.A. When it came to Euro dance music of the late '80s and early '90s, as a famous T-shirt worn by Madonna once claimed, Italians really did do it better. From Black Box (and spin-off project Starlight) to 49ers, Cappella to Corona, Jinny to Livin' Joy, Italy is to commercial dance music what Sweden is to pop. And this week in 1993, another Italian outfit debuted with one of the year's best club tracks. Based on a synth riff from Simple Minds' "New Gold Dream (81-82-83-84)", "Open Your Mind" also features samples from "Solid" by Ashford & Simpson and the film Total Recall. Next week: two iconic Australian bands that'd been releasing music since the start of the '80s appear to have run out of steam. It's funny, I was a big fan of both Bryan Adams and Def Leppard and never once thought they sounded similar. Joe Elliott's voice is so unique and I don't think anybody sounds like him. Also, because I wasn't allowed to listen to music at this point in my childhood, I'm not familiar with the 2 top 10 Toni Pearen tracks but when I was allowed to again in late 94 I thought Walkaway Lover was her debut and was really surprised it didn't become a big hit because I thought it was a great pop tune. I think it's the music more than the vocals that warrants the Bryan Adams/Def Leppard comparisons. Their early 90s albums were both produced by Mutt Lange. Wow, I can't believe I did not find this site a lot earlier than I have now. I started interest in charts late 87 and lost interest in the mid 90's and you have covered so much that I have spend so much time in the last couple of days just looking through your pages. Figure that we must be about the same age as 87 I was in year 7 and through most of high school, I was known as the person to come to if you wanted to know what the number 1 song of the week was. Congratulations on a great blog, you have me as a regular now. Always nice to get a new regular. Thanks for reading! Are You Gonna Go My Way - was this the first (and only) time the same title was #1 on both the singles and album chart? No, it has also happened with 'Age of Reason', and probably several other times. I heard 'Be My Baby' on UK Chart Attack about 6 months before its local release/charting. Maybe it finally got a release here due to the Lenny Kravitz tie-in? Def Leppard's sound had really not progressed for the 'Adrenalize' album, going by the singles. Of course, it probably didn't help that Bryan Adams had been releasing identikit versions of these tracks over the last 18 months. You really would think that Def Leppard would have had enough clout to demand their own 'sound' from Mutt Lange. This is one song I had totally forgotten about/hand't thought of since '93 until seeing it mentioned on something last year. I wasn't aware of 'What Can You Do For Me' with either release, and didn't hear it until they guest programmed rage in 2008. I liked 'I Want You', but thought 'In Your Room' was superior. Toni really needed an album out around this time, or a few months later, with a (decent) third single, to have capitalised on her success. Delaying an album for a year or more (or 18+ months in Toni's case) almost never works out. The only artist I can think of that it has worked for is The Prodigy with 'The Fat of the Land'. 'Walkaway Lover' was mentioned as being her new single towards the end of '93 in Smash Hits, but for whatever reason, it took nearly another year to come out. I liked 'Open Your Mind', but it's a bit repetitive, and I probably prefer the '97 remix. It probably took a good year or so to find those pink and green bear/monster suits for the Walkaway Lover music video. You can't rush genius. 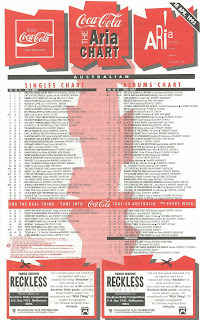 Both of Toni Pearen's big hits peaked at #10 and went gold. I always assumed "I Want You" was the bigger hit because it seemed to be played everywhere for a long time, whereas "In Your Room" seemed to come and go quickly. But exhaustive and in-depth (I read Wikipedia) research tells me the former spent 20 weeks in the top 100 and the latter spent 30 weeks. Then again "I Want You" was particularly radio-friendly, so I guess that was why we heard it so much.